The McKinley Stationary Living Room Group by Marshfield at Conlin's Furniture in the Montana, North Dakota, South Dakota, Minnesota, and Wyoming area. Product availability may vary. Contact us for the most current availability on this product. Classic and traditional elements make this collection of living room furniture perfect for your refined style home. 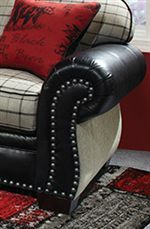 Rolled arms are adorned with nailhead trim and bun feet frame plush, high density foam cushions for ample comfort and support. Made to order right here in the USA you can choose from an extensive catalog of upholstery option to create the perfect look for your home. The McKinley collection is a great option if you are looking for Traditional furniture in the Montana, North Dakota, South Dakota, Minnesota, and Wyoming area. Browse other items in the McKinley collection from Conlin's Furniture in the Montana, North Dakota, South Dakota, Minnesota, and Wyoming area.